Responding to President Mugabe’s assurance at the Commonwealth Summit that gay rights campaigner Peter Tatchell would be welcome to visit Zimbabwe, Mr. Tatchell says he hopes to take up the President’s offer early next year. “I want a meeting with the President to urge an end to human rights abuses, and to support his call for Britain to help fund land redistribution”, said Mr. Tatchell. “The President is wrong to suggest that myself and OutRage! are part of a British-government conspiracy to sabotage his government’s land reform programme. We agree with President Mugabe that Britain has a moral duty to help remedy the injustices of the colonial era by providing financial aid for a buy-back of white-owned farms. “Providing President Mugabe will guarantee my immunity from arrest and agree to meet me, I will go to Zimbabwe early next year. I hope to persuade him to drop his antigay crusade and to include a ban on discrimination against homosexuals in Zimbabwe’s new constitution”, said Mr. Tatchell. “I would gladly have afternoon tea with the President. I don’t hate him. It is his homophobic policies that are objectionable. I would much prefer Mr. Mugabe to be a friend of the gay community, instead of an enemy. “A calm, reasoned meeting with the President might help remedy his misunderstandings about gay people and encourage him to adopt a more enlightened policy on gay issues. “I am prepared to forgive and forget, providing Mr. Mugabe starts respecting the human rights of all Zimbweans. He must take tough action to end the use of torture, censorship, detention without trial, and the suppression of strikes and peaceful protests. “Despite our disagreement on human rights issues, I support President Mugabe’s request that Britain help fund a land reform programme, including a buy-back of white-owned farms. But this funding must be conditional on the Zimbabwe government ending human rights abuses and stamping out corruption. “There need to be guarantees that land reform will benefit impoverished rural communities, and not be squandered in corrupt handouts to Mr. Mugabe’s cronies”, said Mr. Tatchell. Mr. Mugabe made his offer that Tatchell would be welcome to visit Zimbabwe at the Commonwealth Summit in Durban on Friday, 12th November, as reported in the London newspaper, The Independent, on 13th November. At a preliminary court hearing on Friday, 19th November, Mr. Tatchell and two OutRage! 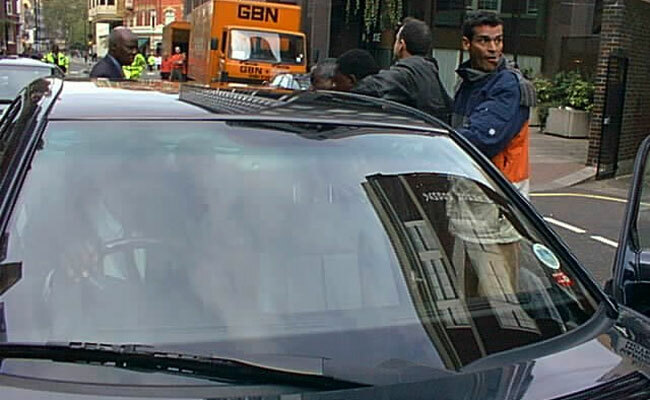 colleagues, Chris Morris and Alastair Williams, pleaded “not guilty” to public disorder charges arising from the citizen’s arrest of President Mugabe on 30th October, when they ambushed the President’s car, forcing it to halt and allowing Mr. Tatchell to open the car door and grab Mugabe by the arm. The three OutRage! defendants who have been dubbed the “Mugabe Three” are expected to stand trial early next year. The citizen’s arrest was the third year in a row that Mr. Tatchell has confronted President Mugabe over gay human rights abuses. Last year, he got into the ante-room of the President’s apartment at the St. James’s Court / Crown Plaza Hotel in London, before being stopped by security guards. He was sent away with the promise that the President would meet him the following day: but Mugabe then cried off, pleading a busy schedule. In 1998, Mr. Tatchell breached security at the Africa at 40 conference in London’s Central Hall Westminster, challenging Mugabe face-to-face as he was taking tea with other African leaders and the conference organisers. Ejected by Special Branch officers, he was threatened with arrest, but never charged. Following the Pink Paper’s leading front page article, (Friday, 12th Nov.), GALZ, Gays and Lesbians in Zimbabwe, have written the following letter to remove any doubt about their position on the attempted arrest of President Mugabe on the 30th October and the resultant positive developments. The article “Gays attacked in Zimbabwe after OutRage! stunt” dangerously misrepresents the situation it sparked in Zimbabwe. Gross distortions of this nature, especially by the foreign press, play straight into the hands of our persecutors who delight in painting gays and lesbians as liars and alarmists. It is difficult enough to be lesbian and gay in this country without the foreign press feeding fuel to our enemies. The GALZ ‘state of emergency’ was called in reponse to a single incident involving attacks on two gay men, not ‘a number of gay men’. It was isolated and not part of ‘a series of attacks,’ as the Pink Paper claims. The statement that “there were other reports of attacks on gay men by the police across Zimbabwe” is a total fabrication and certainly did not emanate from this office. Furthermore, nobody was sexually assaulted. Our state of emergency meant that those who were in the public eye were asked to stay in phone contact with each other until the temperature cooled down. The emergency was called off when it was understood that this incident did not constitute the start of another gay-bashing campaign. Violence against lesbians and gay men is increasing in urban areas as a general trend. But the ‘damage’ to the lesbian and gay community in this country stems directly from President Mugabe’s antigay rhetoric which has had a devastating effect on us: the blame for the violence must rest squarely on the shoulders of Mugabe and his lackeys, not on the independent actions of foreign groups. Human Rights defenders tire of being blamed for violence which they have not committed. The OutRage! incident simply brought into sharp focus the human rights abuses of the Harare regime. Just because it would be dangerous for such style of action to take place in Zimbabwe does not mean that it is not allowable in an open and democratic society. Remember too that GALZ was blamed by the authorities and the state-controlled media for causing the violence during the 1995 and 1996 Zimbabwe International Book Fairs even though it was this organisation that was the victim of threats, and thugs trashed the GALZ stand. People who speak out against direct action and plead for gradual change talk the language of the abuser. Generally, people do not give over social space unless forced or if they see it is in their own self interest to do so. A black lesbian was beaten up a couple of days ago not as a result of the OutRage! ‘stunt’ but because she had been seen on television giving evidence to the constitutional commission. Gay men are sometimes beaten up outside nightclubs because people here have been taught to hate gays and gangsters have been given licence to taunt and harass us. The white gay community would have been the least affected by the action of OutRage!. White gay men are not the target of gay bashers; they are targets of blackmailers. GALZ is unaware of the human rights activities of Paranoid ‘Rufus’. Many Zimbabweans have relished the humiliation of the president in London. They have derived immense satisfaction from seeing the Almighty on high brought low. The President’s cage was seriously rattled and he is still smarting with indignation. His subsequent rantings that it was a plot orchestrated by Gay Gangster Blair and MI5 have been met with appropriate scorn and ridicule. The OutRage! incident sparked a diplomatic row but only in the sense of helping a smouldering situation burst into flames. It put into perspective the abuse of lesbians and gay men within the context of broader human rights abuses in this country. For too long, our government has dined out on international declarations and covenants to which it is a signatory. The chickens have come home to roost and the Commonwealth and other international bodies are now calling for genuine compliance with human rights treaties and not mere rhetorical compliance. If our political leaders do not make a genuine effort to uphold the liberties of our people, they can only expect local and international pressure to intensify. Torture and genocide are serious matters for the attention of the international community; they are not minor domestic matters. As I pointed out in my telephone conversation with David Northmore, the London incident has led to a number of positive outcomes. Even as I write, Zimbabwe television (ZTV) is inviting representatives from GALZ to appear as panelists on a discussion programme next Tuesday. The topic is the incident in London and other issues. This is a first and it is a major opportunity for us to be heard. The invitation comes in direct response to the OutRage! incident. A reporter from the Daily Mail is here at the moment interviewing three black members of GALZ as part of her research for an in-depth article about their lives. All the local newspapers, even the state-controlled media, are now falling over themselves to print our stories. We are being heard for the first time and the old rhetoric of unAfrican, unBiblical is being drowned by a human rights chorus shouting accountability. In the Thursday, 11th November edition of the Financial Gazette, which normally passes over gay issues, there are no less than nine articles, letters and features on issues of gay and general human rights as well as the deteriorating relationship between Britain and Zimbabwe. In total, since Sunday, 31st October, GALZ has collected no less than 58 newspaper articles on the subject of lesbian and gay issues and the diplomatic incident in London. It has also sparked a heated debate – people are talking. The action of OutRage! has strengthened our credibility within the general human rights movement in Zimbabwe. Tatchell mentioned the torture of the journalists and the genocide in Matabeleland. GALZ’s reaction to these comments have been heard, acknowledged and won us friends. Publicity is our best secret weapon. The recent limelight comes directly in the wake of the OutRage! action and, for that, we thank Peter Tatchell and his crew. OutRage! has condemned as “shameful appeasement” the British Government’s expression of “regret” to President Mugabe over his citizen’s arrest by OutRage! members during a visit to London on the 30th October. The words of regret were expressed to Zimbabwe’s Foreign Minister in a phone call by Peter Hain MP, Minister of State at the Foreign Office in London. “Instead of regretting our protest in defence of human rights, the Foreign Office should have apologised to the people of Zimbabwe for failing to arrest President Mugabe over his government’s violation of the 1984 UN Convention Against Torture”, said Peter Tatchell of OutRage!. Mr. Tatchell, who arrested President Mugabe during the OutRage! ambush of the President’s motorcade in central London, is a former Labour parliamentary candidate, who fought the Bermondsey by-election in 1983. He has written to the Labour Prime Minister Tony Blair. Tatchell’s letter urges Mr. Blair to initiate moves at next week’s Commonwealth Summit in South Africa to “expel Zimbabwe from the Commonwealth and to suspend British aid to Zimbabwe, until such time as Robert Mugabe’s government halts its attacks on the gay community and other abuses of human rights”. Meanwhile, Tatchell has revealed that he campaigned in the 1970s in support of ZANU’s “Chimurenga” to overthrow white minority rule in Zimbabwe. “During the 1970s, when I was a student, I supported ZANU’s war of liberation, fundraising to buy medical supplies for ZANU’s fighters in the bush”, said Tatchell. “The President has betrayed ZANU’s ideals of social justice and human rights. Mugabe is Ian Smith with a black face. It is sickening the way he comes to London to buy luxuries at Harrods while millions of Zimbabweans are living in poverty”, he said. Mr. Tatchell detailed the citizen’s arrest of President Mugabe and condemned human rights abuses by the Zimbabwean government in an interview on NETWORK AFRICA, which was broadcast to Zimbabwe by the BBC World Service last Monday morning, 8th November 1999, at 3:30 and 5:30 hours GMT. Peter Tatchell, Chris Morris and Alastair Williams of OutRage! were arrested for their involvement in the citizen’s arrest of President Mugabe. They were held in police cells for 7 hours (until Mugabe had left Britain). Released on police bail, they are required to report to Belgravia police station in London on Tuesday, 16th November at 10 a.m., when they will be informed whether they are to be prosecuted. I am writing on behalf of the gay human rights group OutRage! to request that, during the Commonwealth Summit in South Africa, you initiate moves to expel Zimbabwe from the Commonwealth and to suspend British aid to Zimbabwe, until such time as Robert Mugabe’s government halts its attacks on the gay community and other abuses of human rights. The expulsion of Zimbabwe is recommended by the prestigious London-based Foreign Policy Centre, of which you are a patron. The Zimbabwean government has long flouted international human rights conventions: from the massacres in Matabeleland in the 1980s, to the ban on gay participation in the Zimbabwe International Book Fair in 1995 and the torture of journalists Ray Choto and Mark Chavunduka earlier this year. President Mugabe’s government stands accused of murder, torture, censorship, detention without trial, bans on strikes and protests, and the violent suppression of peaceful dissent. The President has denounced lesbians and gays as “sexual perverts” and “beasts”, who are “worse than dogs and pigs”. Rejecting calls for homosexual human rights, he said: “We don’t believe they have any rights at all”. He has warned gay people to leave Zimbabwe “voluntarily” or face “dire consequences”. Since his inflammatory comments, homosexuals in Zimbabwe have been beaten, arrested, framed on trumped up charges, fire-bombed and threatened with death. Your government is committed to an ethical foreign policy. We ask you to give this policy effect by cooperating with other Commonwealth leaders to isolate Zimbabwe and deny President Mugabe the trade and aid on which his government depends for its survival.